Ira Stanley Clifford Pinney was born in Yeovil during the autumn of 1896. He was the eldest of the five children of leather parer Richard Pinney (1869-1921) and Ada Maria Baker née Taylor (1874-1947). Richard and Ada's children were Ira, Gladys Ethel May (1897-1974), Edward Ralph (1899-1959), Beatrice Ella Theresa (1903-1989) and Alfred Horace (1906-1994). In the 1901 census the family were living at 164 Park Street but by the time of the 1911 census had moved to 40 Vicarage Street. At this time 15-year old Ira was working as a milkman's errand boy. Ira enlisted at Yeovil, joining the 1/6th Battalion (Territorials) Devonshire Regiment. His Service Number was 266886 suggesting that he enlisted during 1917. The 6th Devons were formed from Volunteer units when the Territorial Army was created in 1908 and recruited men from the north of the county. With the 4th and 5th Battalions, the 6th were at their annual camp near Exeter when the First World War began. Embodied on the outbreak of war, the battalion assembled on Salisbury Plain for training and to receive reinforcements. A second battalion – known initially as the 6th (Reserve) Battalion but soon retitled the 2/6th – was formed from Territorials who had not elected to serve overseas and from the recruits who flooded in after war had been declared. At the end of 1915 the 1/6th were sent to Mesopotamia and they arrived at Basra on 3rd January 1916. The years 1917 (when it is thought that Ira joined his battalion in Basra) and 1918 saw the 1/6th on the Twin Canals, where they relieved the 1/4th Devons, and on lines of communication duties in a harsh environment which continued to exact a high price in sickness. In September 1918 at Margil they were struck by influenza, which alone claimed 89 lives. During their three years in Mesopotamia the 1/6th lost twice as many men to illness as to enemy action. They had won three battle honours. Although we don't know the specifics, it appears that Ira succumbed to an undisclosed illness and was hospitalised in 33 British General Hospital, Basra, where he died on Monday 4 November 1918 - less than a week before the Armistice. He was just 22 years old. Ira Pinney was interred in Basra War Cemetery - Grave I.S.10 - and his name is recorded on the War Memorial in the Borough. 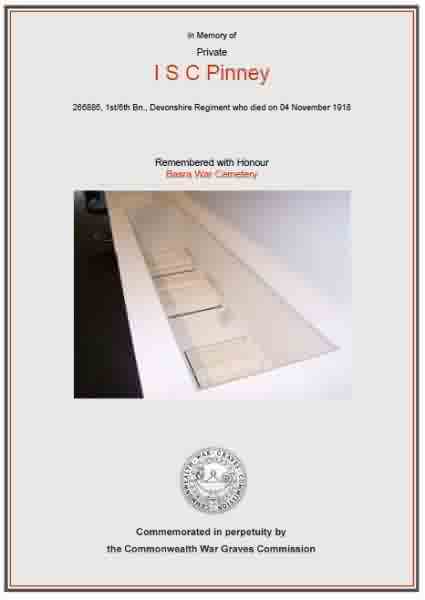 The Commonwealth War Graves Commission certificate in memory of Ira Pinney.